In Funny People, Adam Sandler plays a dying man. He goes to visit a former love (Leslie Mann). 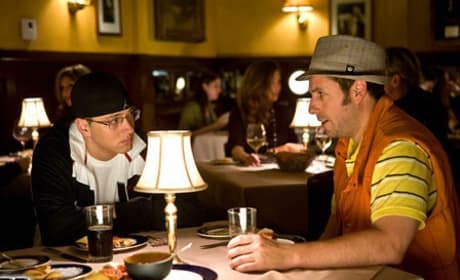 Eminem makes a cameo in the movie Funny People. He's seen here with Adam Sandler, who plays the character of George Simmons. 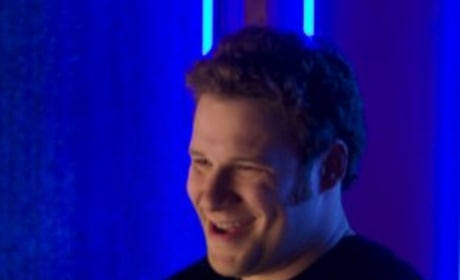 Ira Wright is played by Seth Rogen in Funny People. He forms a friendship with a character portrayed by Adam Sandler. George Simmons is played by Adam Sandler. He's the main character in Funny People. Funny People is a Judd Apatow movie. It stars Adam Sandler and Seth Rogen. George Simmons: So, Ira Wright? That's not your real name. You're hiding some Judaism. Ira Wright: I don't think I can hide that. My face is circumcised. Dr. Lars: It's too early to know who's winning the fight: the medicine or the disease. George Simmons: Did anybody ever tell you, you have a very scary accent? Dr. Lars: You are a very funny man. I enjoy your movies. George Simmons: And I enjoy all of your movies. Dr. Lars: [surprised] Which movies? George Simmons: The ones where you try to kill Bruce Willis.